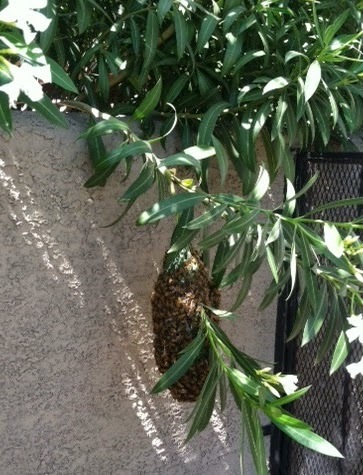 Tucson Daily Photo ~: Swirling bee swarm - amazing! For the last few days we have had a bee swarm at my office and we have all been watching in amazement as the bee "egg" has grown in size. I work with many scientists so there was no shortage of suggestions and opinions as to what would happen and what we should do. One of my coworkers has a friend who raises bees and she was thrilled to be able to adopt these bees. She was coming to collect the swam (don't know how, exactly, she was going to do that!) this evening. I'll see what's happening tomorrow - maybe we will be bee-less! Update: When the bee keeper arrived to collect the swarm she discovered that it had dispersed. Nature is so mysterious!